Seattle, WA, (1-band, 12 inch, black and white). Northwestern and central Snohomish County, (1 meter, color). Central Puget Sound, including Seattle, WA, (12 inch, color). Yakima metropolitan area, (1 meter, color). Washington State, (4-band, 1 meter). This imagery is available using ArcGIS for Server Image Services on WAGDA. Once you have added the image service to ArcMap, go into the properties to display the footprints. You should be able to select the rasters you need either from a spatial selection or using the attribute table. To download the data, select the tiles you want, right click on the layer and choose Data -> Download Selected Rasters. Need help? Send an email to uwlib-gis@uw.edu. Washington State, mosaic by county, (1 meter, color). Washington State, 1990s various dates, (1 meter, black and white). Washington State, (3-band, 18 inch). Current UW students, faculty, and staff may download the above index map and then request individual map tiles for areas of interest by email to uwlib-gis@uw.edu. Yakima County, WA, (3-band, 12 inch). Also available on CD in Suzzallo Map Collection (G4283 Y3 A25 2002 Y3). Snohomish County, WA, (1-band, 10 foot). Also available on CD in Suzzallo Map Collection (G4283.S6.1997.S6). One you have created a connection, browse to the Imagery Services folder to see a list of image services available. Washington State partial, (Multispectral, 30 meter; Thermal, 60 meter; Panchromatic, 15 meter). See metadata and scene index provided courtesy of CFR Rural Technology Institute. Near-Global, (GeoCover 2000, 15 meter, UTM WGS84; Geocover 1990, 30 meter, UTM WGS84). See indexes to identify tile numbers. Washington State partial, MSS and TM scenes compilation, (5- or 6-band, 30 or 60 meter, UTM10 NAD27). Post-processing geometric and radiometric corrections. Also available on cassette tape and CD in Suzzallo Map Collection (G4281.A43.1990.E7). Global DEM, SRTM and GTOPO30 compilation, (30 arc second, approx. 1 km). This is version 1. Version 2 is available at NASA. Near-Global DEM from Latitude 57S-61N, (3 arc second, approx. 90 meter, Geo WGS84, .bil format). View and purchase ASTER, EO-1, Landsat 35 year Archive, MODIS, and TerraLook. Preview and purchase USGS satellite imagery. 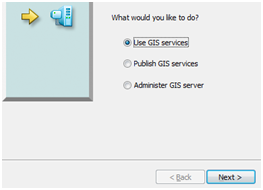 Download GIS data, maps, applications, and tools. View imagery and download World Wind applications and applets.